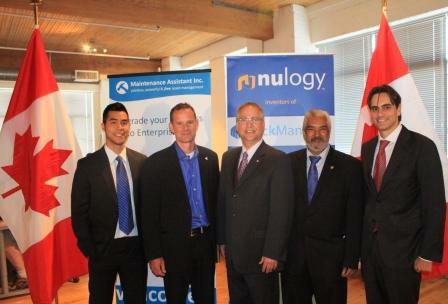 Toronto, Ontario (June 24, 2011) – Maintenance Assistant will have a greater opportunity to develop new technologies thanks to a Government of Canada investment of nearly $1 million announced Monday, June 20th by the Honourable Gary Goodyear, Minister of State for the Federal Economic Development Agency for Southern Ontario (FedDev Ontario). Maintenance Assistant Inc. will receive a contribution of up to $975,000 to enhance its Collaborative Computerized Maintenance Management software to help businesses better maintain equipment and machinery, as well as procure parts and services through a web-based format. The company has also received support from accredited angel investors. Investing in Business Innovation is a direct result of feedback from business leaders, academics and community leaders from across southern Ontario, who suggested FedDev Ontario take a leadership role in encouraging entrepreneurs and investors to take the risks necessary to put southern Ontario businesses on the map. FedDev Ontario was created as part of Canada’s Economic Action Plan to support businesses and communities in southern Ontario. Now in its second year of operation, the Agency has launched a number of initiatives to create a Southern Ontario Advantage and place the region in a strong position to compete in the global economy. FedDev Ontario’s Investing in Business Innovation is designed to boost private sector investment in start-up businesses to accelerate the development of new products, processes and practices and help bring them to market. Funding under the initiative is also available for angel investor networks and their associations to attract new investment and support the growth of angel investment funds.